By Terry Dunn on Sept. 12, 2018 at 12:12 a.m. Helping you understand the Lipo lingo. 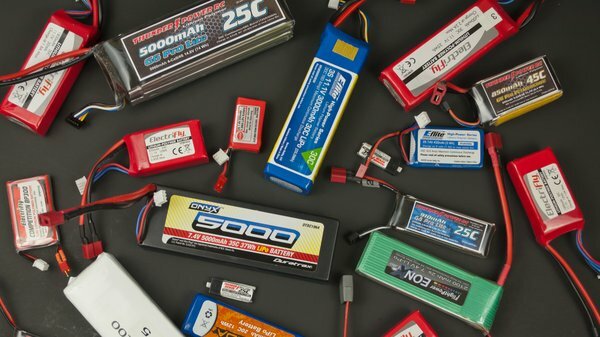 The Lithium-Polymer (LiPo) batteries that we use in RC vehicles have evolved tremendously since they were first introduced to the hobby about 15 years ago. Most of that progress can be traced though ever-higher rapid discharge capabilities. Early users had to link multiple cells in parallel just to have enough juice to get airborne. Now there are LiPo cells that can safely deliver hundreds of amps! But is there a downside to using the latest high-discharge lithium batteries? In this article, I'll cover some LiPo basics and then analyze the pros and cons of using rapid-discharge cells. I wrote an article a few years ago that covered the basics of LiPo batteries. You may want to review it if you're totally new to the LiPo world. But I'll be recycling some of the high points from that piece into this article as well. When talking about a LiPo, the primary characteristics to understand are the battery's voltage and capacity. This is typically noted in a shorthand such as "4S-2200". "4S" denotes that the battery has four cells in series. The nominal voltage of each cell is 3.7 volts (4.2v fully-charged), so the total pack voltage is: 4 cells x 3.7v = 14.8v. The second number denotes the capacity of the battery in milliamp-hours (mAh). A fully-charged 2200mAh pack is rated to provide a current of 2200 milliamps (2.2 amps) for one hour before it is completely discharged. This capacity value is totally independent of how many cells are in series. In simple terms, the capacity value allows you to estimate how long a battery will provide useful power in a given application. In practical terms for RC use, the capacity rating is typically only helpful for rough comparisons of different batteries. i.e. a 2S-5000 battery will provide about double the run time of a 2S-2500 LiPo in the same RC car. A very important, yet often misunderstood (or overlooked), aspect of LiPo batteries is their maximum discharge rate. This value allows you to determine how many amps the battery can output continuously without becoming damaged. Since many RC applications demand relatively high electrical current, the discharge rate of a battery can be a very significant factor in the overall performance of the vehicle. 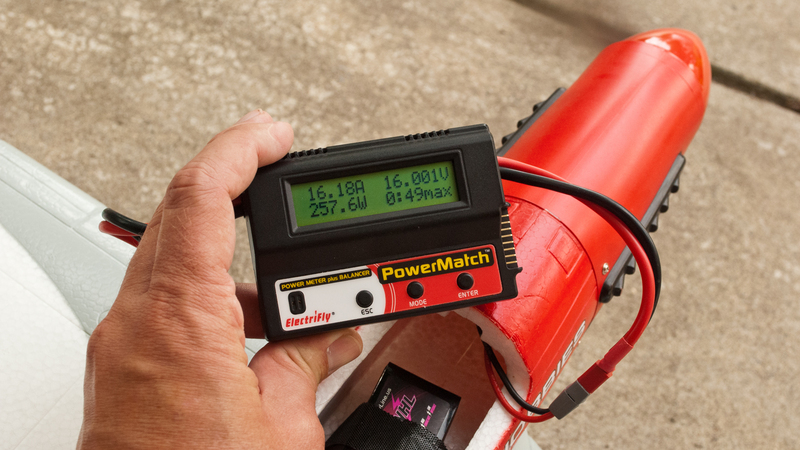 A very important, yet often misunderstood (or overlooked), aspect of LiPo batteries is their maximum discharge rate. Discharge rate is typically expressed as a multiple of C. The internet can't seem to agree on what "C" really means. Whether it is coulombs of charge, the capacity of the battery, or the one-hour charge rate isn't really important for our purposes anyway. The end result is the same. The calculation tells us that this battery can safely be used in a system that is expected to continuously pull 44 amps or less. It also means that a fully-charged battery will last about three minutes at that current draw. Using the same logic, a 4S-2200 30C battery would be valid for applications requiring up to 66 amps of current. Obviously, it is necessary to know the maximum current demands of your model in order to choose a battery with the appropriate discharge rating. For RC aircraft that are factory-equipped with a power system, the manual should indicate what you will need. If you intend to deviate from the stock setup (with a different motor, propeller, or battery voltage) or build your own system from individual components, you will need to calculate the predicted amp draw. Seriously…you should have a rough idea of an RC power system's expected performance parameters before you ever energize it. Merely guessing is a good way to burn up components in spectacular fashion. There are several online calculators intended for this purpose. I use eCalc, which has a small annual fee. You also want to have a tool, commonly called a "Watt-Meter", to analyze your completed power system with real-life measurements. A Watt-Meter is indispensable for tweaking and trouble-shooting electric aircraft power systems. Mine has paid for itself many times over in saved components and improved model performance. The latest generation of high-discharge LiPo batteries advertise continuous discharge rates of 100C and more. To put it another way, a battery discharging at a 100C rate would go from fully-charged to completely-spent in 36 seconds! Such high discharge rates and brief motor run times are impractical for all but a handful of RC applications. But a battery that can handle 100C discharge does not necessarily have to be pushed that hard. That begs the question, "Does a 100C battery offer any advantages in an application where 30C would suffice?" Let's see. 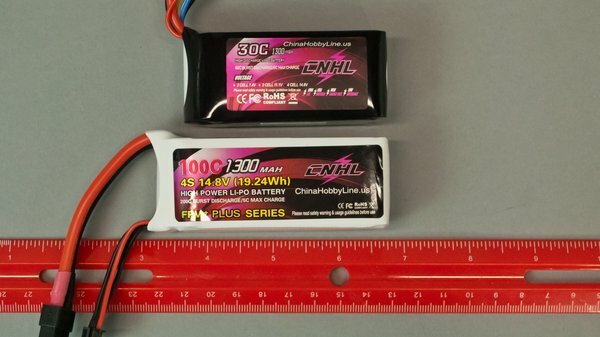 China Hobby Line (CNHL) provided two pairs of 4S-1300mAh batteries for testing. I pair of batteries is rated at 30C, while the remaining pair is capable of 100C. Those are continuous discharge ratings. Both batteries are advertised to be capable of double those discharge rates in short bursts. I tested both sets of batteries in a variety of RC aircraft and measured the performance differences. To be clear, the purpose of my testing was NOT to verify the accuracy of the claimed discharge ratings for these batteries. I don't even have equipment capable of handling the 130-amp continuous maximum discharge of the 100C packs (not to mention the 260-amp burst discharge rating!). My intent was simply to uncover any measureable differences between similar LiPo cells with different discharge ratings. This was my first time using CNHL batteries, which are very popular with multi-rotor pilots. There is no reason not to use them in my fixed-wing models as well. The samples I received are well made and have nice, flexible wire on both the power and balance leads. I inspected a few of the solder joints and found them to be clean and shiny (as they should be). I was rather surprised at the physical differences between these batteries. The 30C packs are very similar size-wise to many of my other 1300mAH LiPo packs with 30C ratings. While the 100C packs have essentially the same girth, they are significantly longer (88mm versus 77mm). These LiPo batteries from China Hobby Line have the same voltage and capacity, but significantly different maximum discharge rates. I tested their relative performance in several RC aircraft. There is a notable weight difference between these packs. The 30C batteries weigh in at 146 grams (5.2 oz). I found the 100C packs to be significantly heavier at 172 grams (6.1 oz). Those 26 extra grams (.9 oz) equate to an 18% difference, which could be crucial on some models. I also measured the internal resistance of the individual cells in each pack. All of the 30C cells have an internal resistance of 6 milliohms. All but one of the 100C cells are 5 milliohm. The outlier cell measured in at 4 milliohms. Like many rapidly-evolving technologies, prices on LiPo batteries tend to be quite dynamic. When new cells get developed, previous generations get cheaper. As I write this, CNHL is selling the 4S-1300mAh 30C packs at $9.78 and the 4S-1300mAh 100C batteries are priced at $16.49. While $6.71 is a significant price difference when viewed as a percentage (69%), it's peanuts in terms of the overall investment required for whatever model they'll be used in. I don't expect that either price will cause heartburn for most modelers. I scanned the current fleet of models in my hangar and picked four of them for this battery testing. My only constraint was that the power system in each model had to be capable of running a 4S battery at full throttle within the advertised burst discharge limit of the 30C batteries (burst rate is 60C/78 amps). 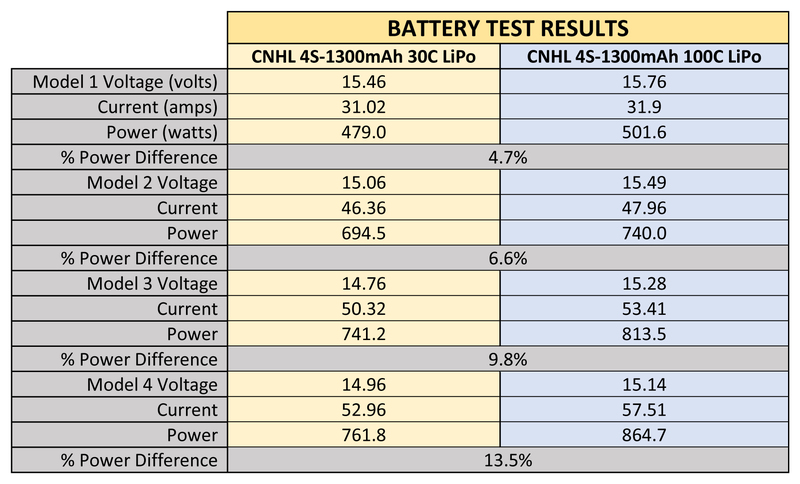 This chart outlines differences in various aspects of the batteries that I tested. The models were secured for static run-ups of their respective power systems, using every battery in turn. All measurements were taken using a Great Planes PowerMatch Watt-Meter. I had the meter set to record the maximum current from any given test. Most tests lasted about 10-20 seconds, just long enough to smoothly advance the throttle to full power and stabilize for a clean reading. I used a Great Planes PowerMatch to collect all performance data during my testing. Such tools are vital when working with electric-powered RC models. In every test, the 100C batteries maintained higher voltage and delivered more current than the 30C packs. This obviously resulted in more power to the propeller (power = voltage x current). In models where the 30C batteries were not being stressed, the power advantages provided by the 100C batteries were slight. The differences were much more significant, however, in models that pulled more amps. The harder the 30C batteries were pushed near their maximum output, the more the 100C batteries outpaced them. The test results indicate a very clear trend. These 100C batteries deliver more power than the 30C batteries of matching voltage and capacity. If power to the prop(s) is your utmost consideration, the higher-rated cells are the clear choice. Yet, it would be rare to choose a battery without also considering other issues. I think the price difference between these two batteries will rarely be a deciding factor. The size and weight deltas, however, could be significant in some applications. I am always wary of adding unnecessary weight to any of my flying models. In a smaller, less powerful setup where the 100C battery does not provide much additional power, its extra weight may not be worth it. The opposite would likely be true for a high-performance model where I'm looking to get every RPM I can. The 100C batteries outperformed the 30C cells by providing more output power in every test. Yet, there are other considerations. One factor that I was not able to test is the long-term durability of the cells. Batteries that are routinely stressed tend to have a shorter cycle life. So I suspect that 100C cells would provide more cycles than 30C cells used in the same application. 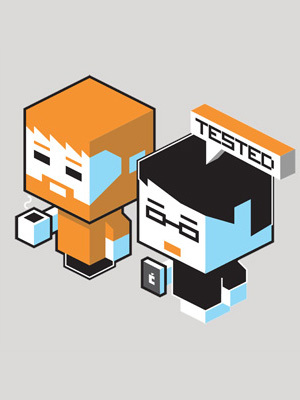 But that's just a theory until I perform long-term testing (which I currently have no plans to do). The original question that I sought to answer is whether 100C batteries offer any advantages in an application where 30C cells would suffice. The answer is definitely "yes". There are power-related advantages. There are also disadvantages which are introduced and must be weighed in light of each specific application. As with most engineering analyses. It's not about declaring winners and losers, but choosing your tradeoffs. Before closing, I also wanted to mention a few things about LiPo charging. In addition to higher discharge rates, many newer LiPo batteries can also handle higher charge rates. All four of the CNHL batteries in this test are rated for 5C charging (1300 x 5 = 6.5 amps). Theoretically, you could charge a battery in just 12 minutes at that rate…as long as your charger can dish out that kind of juice. Many of the newer hobby-grade chargers on the market are designed with fast-charging in mind. The charger I used during my testing is the Hobbymate D6 Duo Pro ($150). This charger has two outputs, allowing you to charge two batteries at the same time. It is an AC/DC charger. When using the AC input, each charging output is capable of 100 watts. If you use an external DC power source with a more capable power supply (6.5 to 30-volt), each port can handle 325 watts of charging power with a charge rate of up to 15 amps! That's crazy for a charger with a footprint about the size of a cellphone. Newer chargers, such as this Hobbymate D6 Duo Pro have fast-charge capabilities and a small footprint. I'm pretty conservative when it comes to charging my LiPo packs. I rarely exceed 1C charge rates even if the battery can handle more. So I doubt that I will use the high-current charging capability of the D6 very often. But it is nice to know that it's there if I ever need it. There are built-in plugs for balance leads with standard JST-XT connectors on the front of the D6. It also has built-in power leads for XT-60 plugs. I use Deans Ultra Plugs on most of my hobby batteries, so I made adapters to fit the charging outputs on the D6. One particularly convenient feature on this charger is a USB output that can deliver up to 2.1 amps. No more dead cell phone at the flying field for me. If your phone is capable of being charged wirelessly (inductive charging), the D6 can do that too. Charging menus and data are displayed on a color LCD screen. Command inputs are made with a single push-button and a jog wheel. I found the user interface to be user-friendly and intuitive. All in all, this is a nice charger with handy features. I appreciate its small size and versatility. It has become the charger that I carry to the flying field for onsite charging of my aircraft, camera, and phone batteries. 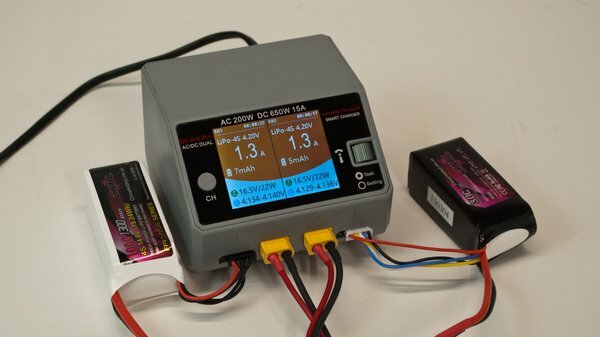 Thanks to Frank Sarfino of China Hobby Line and Hua Tian of Hobbymate for providing the battery and charger samples that were used in this article.